Information Disclosure - Social Responsibility - MICRONICS JAPAN CO.,LTD. 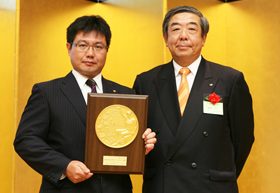 The Securities Analysts Association of Japan has selected MJC as a recipient of the Award for Excellence in Corporate Disclosure four years in a row since 2007. Going forward, we will continue striving to provide fair, timely, and appropriate disclosure of company information related to our business activities, focusing on transparency, fairness, and continuity, in order to facilitate proper evaluation of MJC's corporate value on the part of investors, including shareholders.